Professional photography apparently remains a male-dominated industry, and most photographers in the US earn less than US$10,000. But just over half of all photographers are hoping to make more money this year, and the additional income may come from video production! This is according to a Photo District News (PDN) survey of US photographers, which received 8130 responses, 4282 of whom are professionals. The survey went out to subscribers and social media followers of PDN, Rangefinder, Emerging Photographer magazines, as well as attendees of the WPPI and PhotoPlus Expo trade shows, along with a few other avenues. 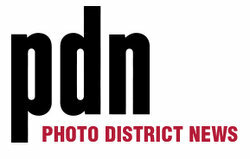 The information gathered by PDN is possibly the most comprehensive survey of US professional photographers, but unfortunately is being released progressively. So far the published data is centred around gender. 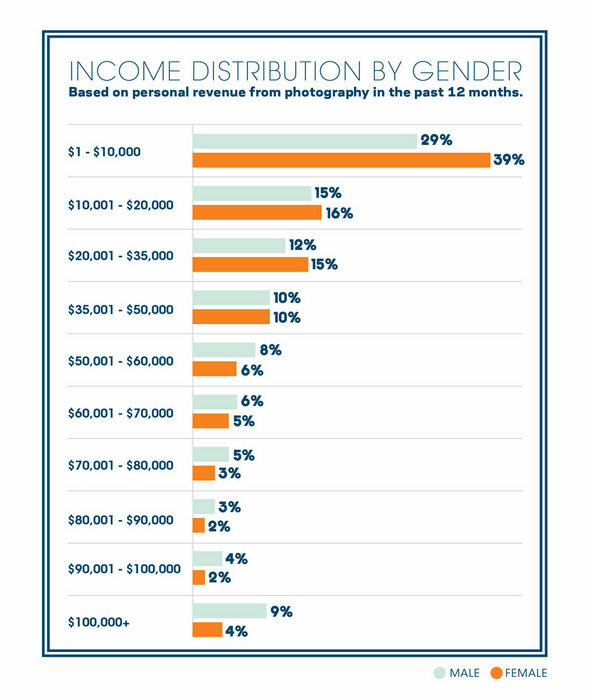 Professional respondents were 60 percent male and these photographers generally earn more than women. Women make up a highest percentage in the three lowest income brackets, which covers US$1 to US$35,000. They dominate the lowest income bracket, US$1 to US$10,000, with 39 percent female against 29 percent male. The second largest percentage margin is in the highest income bracket, US$100,000+, with nine percent men and four percent women. Every income bracket in between has only a few percent points difference, but male photographers scrape in front of the six highest income brackets. The US$35,000 – US$50,000 bracket is tied, with a 10 percent split. But when the numbers are added up, the gender pay gap is more obvious – 35 percent of male photographers earn more than US$50,000, compared to 22 percent of women photographers. Overall, both genders generally fall into lower income categories. This appears to be a realistic representation of the industry, which is increasingly becoming a part-time profession supplemented by other income streams. 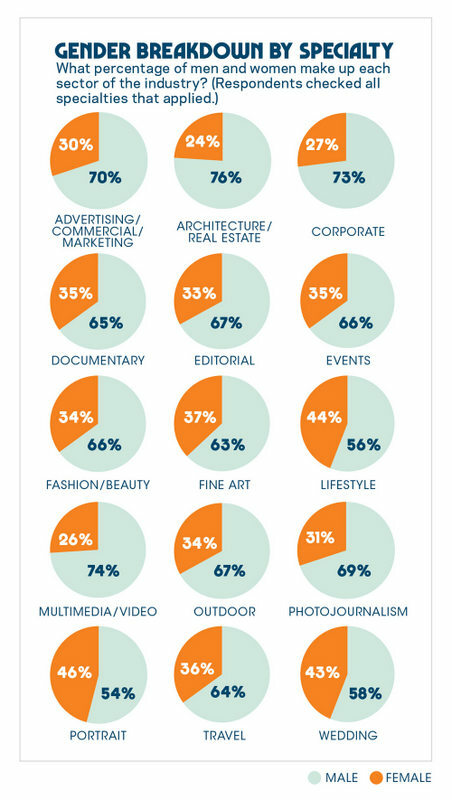 Males have a higher representation in all specialties, but dominate ‘commercial genres’ with upwards of 70 percent in Advertising/Commercial/Marketing, Architecture/Real Estate, and Corporate photography. The Portrait and Wedding categories show a smaller gap, with 54 percent men and 58 percent men. Photography has historically been a male-dominated industry, however the tide is slowly changing – particularly in the Portrait and Wedding Categories. The Australian Institute of Professional Photography (AIPP) estimates it has more female members, around 55 percent. This number will continue to grow – roughly 60 to 70 percent of new members are female. PDN says female photographers are more financially optimistic than their male counterparts. Sixty-one percent of women expect to earn more this year than last, compared with 53 percent of men. On the opposite end of the spectrum, 18 percent of male photographers expect to earn less, compared with 12 percent women. Overall, the majority of photographers are heading into 2018 with confidence! In a separate article, PDN looked at who is shooting video. Apparently 30 percent of professional photographers from all the specialties have moved into video production. Video production is more common among advertising photographers, with 42 percent shooting video for clients. The two specialties with the lowest percentages are wedding and portrait photographers. Perhaps this is due to commercial photographers seamlessly incorporating video into a clients’ project. Whereas a wedding photographer is more likely to outsource a videographer, or a client will simply find their own. Less than 10 percent in all specialities ‘gave up’ on shooting video, while upwards of 20 percent plan to trial video production this year. These stats show that video and stills can work together. While plenty of professional photographers are happy to remain stills specialists, the expectation that a photographer will provide moving pictures as well will inevitably grow over time. Of those involved in video production, most – 69 percent – are shooting with a DSLR. Surprisingly, way more photographers pick DSLRs over mirrorless, with only 13 percent going ‘fully digital’ for video production. That’s about all the interesting information ProCounter plucked from the two PDN articles. Read PDN‘s gender article, and video article. This entry was posted in Business Issues, Deck right, News by Keith Shipton. Bookmark the permalink.